Peru is a multiethnic country formed by the combination of different groups over five centuries, so people in Peru usually treat their nationality as a citizenship rather than an ethnicity. Amerindians inhabited Peruvian territory for several millennia before the Spanish Conquest in the 16th century; according to historian David N. Cook their population decreased from an estimated 5–9 million in the 1520s to around 600,000 in 1620 mainly because of infectious diseases. Spaniards and Africans arrived in large numbers under colonial rule, mixing widely with each other and with indigenous peoples. During the Republic, there has been a gradual immigration of European people (specially from Spain and Italy, and in a less extent from France, the Balkans, Portugal, Great Britain and Germany). Japanese and Chinese arrived in large numbers at the end of nineteenth century. Peru also is home to the renowned pyramids at Machu Picchu, built by the ancient Incan civilization, and the inexplicable Nazca lines that cover acres of land with elaborate drawings that are visible only from the air. Most Peruvians are either Spanish-speaking mestizos–a term that usually refers to a mixture of indigenous and European/Caucasian–or Amerindians, largely Quechua-speaking indigenous people. 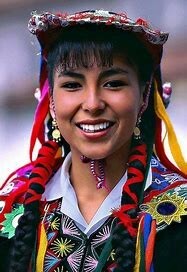 Peruvians of European descent make up about 15 percent of the population. There also are small numbers of persons of African, Japanese, and Chinese ancestry. Mestizos compose about 47% to 59.5% of the total population. The term traditionally denotes Amerindian and European ancestry (mostly Spanish ancestry). This term was part of the caste classification used during colonial times, whereby people of exclusive Spanish descent who were born in the colonies were called criollos, people of mixed Amerindian and Spanish descent were called mestizos, those of African and Spanish descent were called mulattos, and those of Amerindian and African descent were called zambos. Piura, (Piura), Peru’s oldest Spanish-built city, located in the northwest. Samples were obtained by the Molecular Biology Laboratory – DNA Forensics [Laboratorio de Biología Molecular –ADN Forense], in Peru, and by the Area Laboratory of the Ertzaintaza (Basque Police) [Area de Laboratorio Ertzaintaza], in Bilbao, Spain. Peruvian – Mesa Redonda Lima represents 151 relatives of missing persons of the fire on December 29th, 2001 at Mesa Redonda in the area of Lima, who were sampled in 2004 by the Instituto de Medicina Legal in Lima. Source publication: Genetic Diversity of Sixteen STRs in the Peruvian Mesa Redonda Lima Population, JFS, 2004, p852-853.